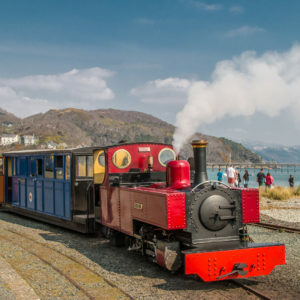 A 16-mile return journey by narrow-gauge steam train through the beautiful Mid-Wales countryside, a wonderful way to watch the world go by. 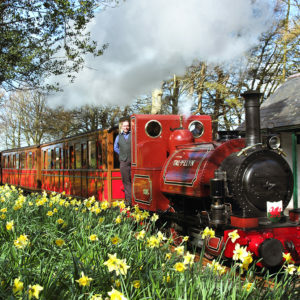 Opened in 1903 to link the market town of Welshpool to the rural community of Llanfair Caereinion, this 2 foot 6 inch narrow gauge steam railway now provides a tourist service for all the family and a welcome change from the rush of everyday life. 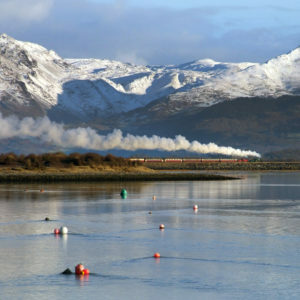 Most of the trains are steam hauled, either by one of the original locomotives or one from abroad. The carriages too are special; those in regular use are from Hungary and Austria with access to the enclosed seating via an open balcony a wonderful way to watch the world go by. The railway runs between Welshpool and Llanfair Caereinion. The train takes 45 minutes to cover the 8-mile journey to Llanfair Caereinion; no one is in a hurry! This is how our great grandparents travelled recreated for you today enjoy. The original builders of the railway, linking the local farmers to the market town of Welshpool, chose a gauge of 2ft 6ins. This allows for tight curves and steep gradients so that the railway can traverse the rolling landscape of this attractive part of Mid Wales. From the window you might spot the occasional heron, goosander, woodpecker or buzzard. The train runs through the Powis Estate where pheasant and deer can be seen and a wide variety of wild flowers. The line follows a river valley, twists round a mill and runs through the middle of farms. Pause for refreshment at the Llanfair Caereinion Tearoom, offering hot and cold drinks, sandwiches, soup, a selection of homemade cakes and ice creams. The tearoom is open to all, when trains are running and on other selected days during the summer. The gift shop at Welshpool Raven Square station also sells hot and cold drinks. Well-stocked gift shops are situated at Welshpool and Llanfair Caereinion stations, selling a variety of gifts for all ages, railway books and DVDs. Welshpool Raven Square Station is about 1 mile from the mainline (Shrewsbury – Machynlleth – Aberystwyth/Pwllheli) station. Passengers arriving by rail should head towards the centre of town and continue straight ahead at the crossroads. Beyond here the road begins to climb before eventually dropping back down to the roundabout at Raven Square. From Shrewsbury the X75 bus stops at the Post Office in Welshpool and Raven Square Station is a 15-minute walk. Both of the main stations are located adjacent to the A458 main road. Welshpool Raven Square station (Postcode for Raven Square is SY21 7LT) is at the west end of the town (follow the brown signs or A458 Machynlleth/Dolgellau). Llanfair Caereinion station (Postcode SY21 0SF) is at the east end of the town. Coming in from the east (Welshpool end) on the A458, the station is first on the left shortly after the 30mph speed restriction starts. From the west continue along the A458 and follow the brown signs. Car parks are situated at Welshpool Raven Square and Llanfair Caereinion termini. There are no car parking facilities at any of the intermediate stations.